Arena competition is divided into the League and the Cup. 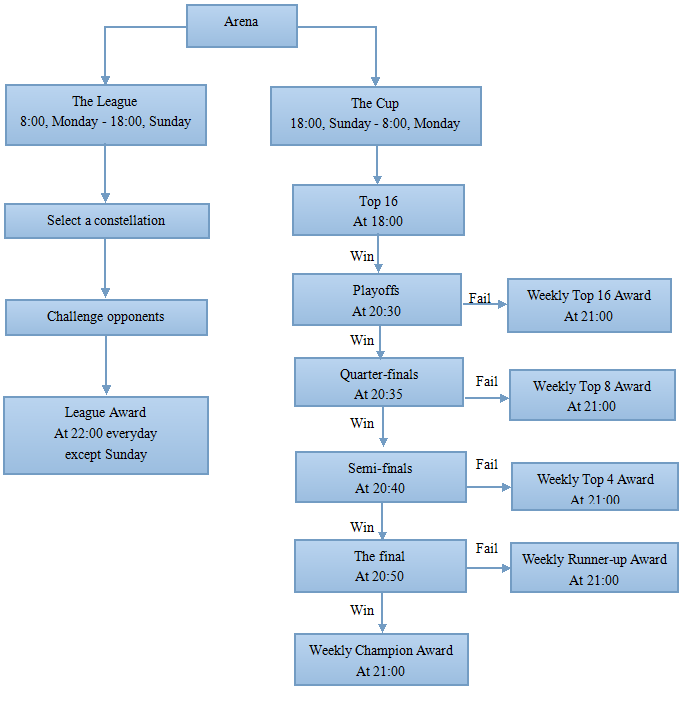 1．The League starts from 8:00/PST am on Monday to 18:00 pm/PST on Sunday. Players can enter everyday during the period. The reward of the League is issued at 22:00/PST every day except Sunday. 2．During the League, you can choose one of the 12 constellations. Once one constellation is chosen, you need to stay there for one week until the next League starts. 3．You can challenge one of the five opponents from the list according to your TP. The opponents are divided into 3 class including Different, Normal and Weak, from which you can receive different Reputation and Points. 4．When you win, you have chance to select one of the three chests. 5．When you sign up, your place is arranged in the order of entering this constellation. Defeat the opponent who is prior to you, and you will be in his place. 6．The 3 teams must have one different card at least. 7．In the 30 rounds, the side whose all cards are all killed fails. Otherwise, the side who has more cards left win. 1．The Cup starts from 18:00/PST to 20:50 pm/PST on Sunday. Awards will be issued at 21:00/PST on Sunday. 2．You can cheer on one of the players who enter the Cup shown in the list from 18:30 to 20:30. 3．Since the Cup starts, you can not challenge others until the next League starts. 4. The system intercepts your place in your group and team data of 18:00/PST. The side with the higher power of 3 teams attacks first. 5. All Cup awards are issued at 21:00/PST. Besides, if you are in the same constellation with the champion, you will receive Champion Chest.